Your temporomandibular joint (TMJ) is the hinge that allows your jaw to open and close. 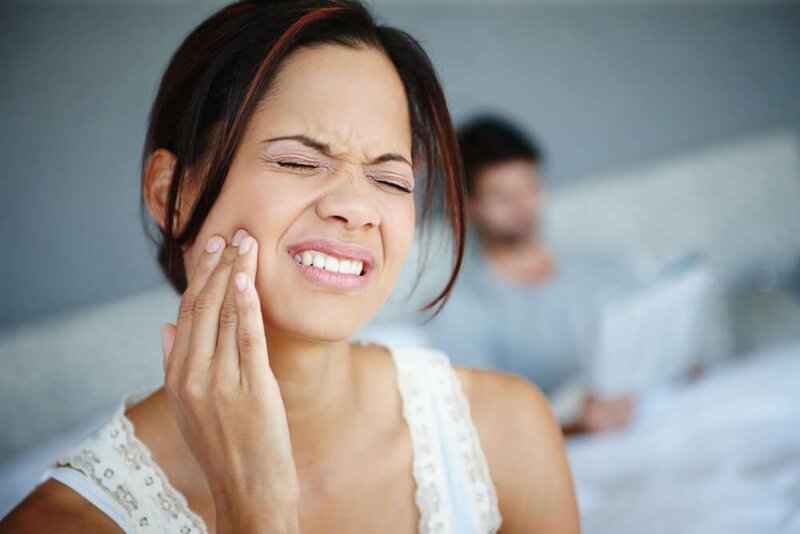 If you clench your jaw, whether you do it as a reaction to anxiety throughout the day or unconsciously when you are asleep, it can result in TMD (temporomandibular joint disorder). This can change your bite alignment creating headaches, tooth pain, and other issues. DentalWorks in Thornton, CO provides many therapies for TMJ disorder, for example, night guards. As soon as your TMD is identified, your dentist will create a custom TMJ treatment plan. You, like everyone, have different ways to react to everyday anxiety. If you're grinding your teeth throughout the day, then you will eventually have toothaches. You might also have nocturnal or nighttime bruxism, meaning that you're grinding your teeth while you sleep. Chronic grinding hurts your oral health, resulting in weakened enamel, pain, and dental cracks. After assessing your teeth grinding, your dentist will create a plan for treatment to stop the damage created by grinding then restore your oral health. Teeth whitening strips and other products bought at the store can cause sensitivity. Over-bleaching and getting products into a cracked tooth may be reasons your teeth hurt. As opposed to risking toothaches, sensitivity, and also bad outcomes, schedule an appointment to find out about professional whitening. Our office in Thornton, CO provides both in-office and home whitening treatments personalized to meet your wants and needs. Hopefully, you won't ever experience this, but if you're in an auto crash or suffer an accident while playing sports, the trauma to your teeth may result in a crack, fracture, chip, or even a knocked-out tooth. It's a good idea to get your teeth examined as soon as possible if you experience a trauma to your teeth or face. To avoid dental injuries during sports, Dental Works in Thornton, CO makes custom mouth guard specially designed for athletes. When you are feeling even a little pain, you need to schedule a consultation at your dentist to find the issue identified and treated. If you are ignoring the pain due to dental worries or anxiety about the chance of a lengthy process, ask about your sedation choices. DentalWorks in Thornton, CO utilizes innovative tools and methods to keep patients comfortable during treatments; however, we also offer you several different types of sedation for additional comfort. And keep in mind that many issues won't heal naturally, so if you waitto get help, the the issue will probably get worse, which might require a lengthier procedure. If you want to avoid spending unnecessary money and time in your dentist's chair, schedule appointment twice a year at DentalWorks in Thornton, CO to get a professional cleaning also an examination. This gives your dental team the chance to suggest proactive treatments such as fluoride treatments, sealants, and much more that will decrease your chance of developing problems. Remember that "an ounce of prevention is worth a pound of cure," according to Benjamin Franklin, especially when it comes to dental care.